Happy Birthday! A Winnie & Walter Card! Hello everyone, Hope you has a wonderful weekend! 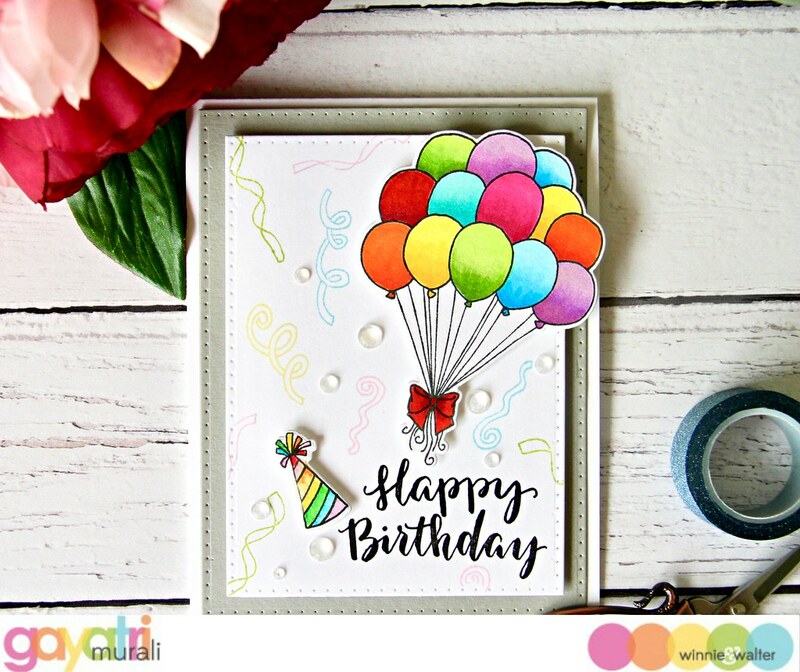 I have a simple yet colourful birthday card to share with you. I am also on Winnie & Walter Blog with this came card. 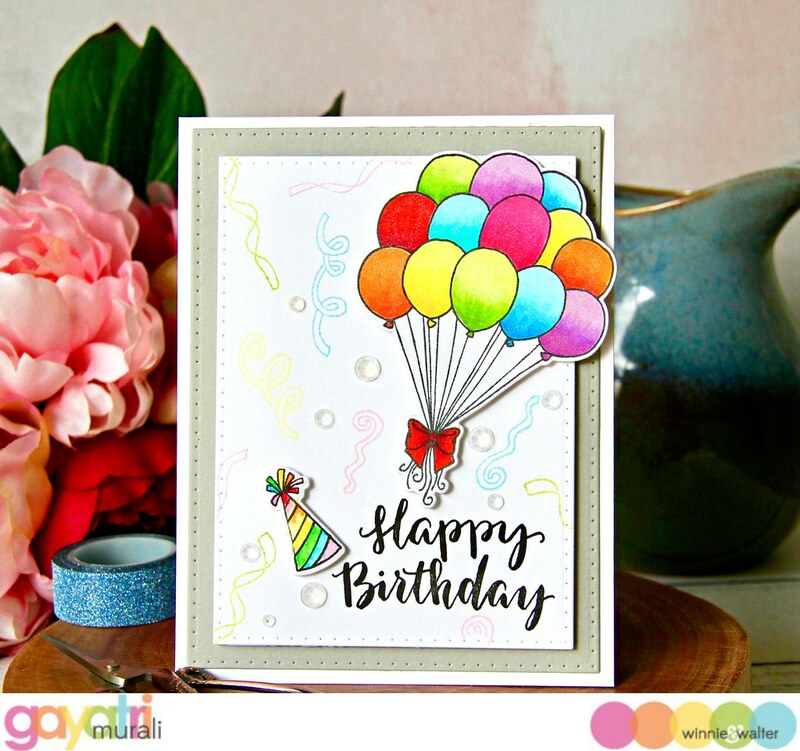 I have used Winnie & Walter’s Happy Dance stamp set to make this card. This set has a balloon cluster which I have been wanting to colour in rainbow colours for a very long time. I had a chance to do it over the weekend and made a birthday card using it. 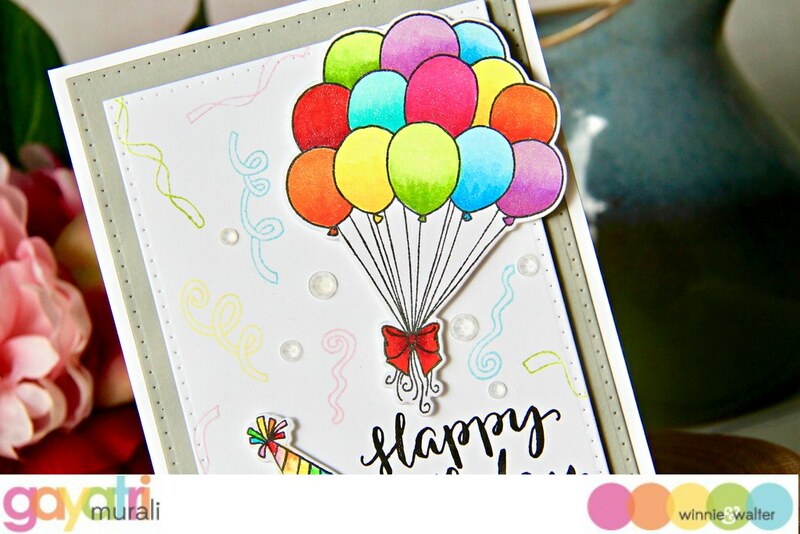 So I stamped and coloured the balloon cluster in rainbow colours using copic markers. Then die cut the image using coordinating die. I also had a watercolored party hat left over from a previous project. I am using it as it is in rainbow colours as well. Since the card is simple, I added lots of layers. The first layer is Slate cardstock which I die cut using the largest rectangle die from Katharine Cutaway and a white cardstock layer die cut using the second smaller rectangle die from the same Katharine Cutaway. I glued the grey panel flush to the card front. ON the smaller white panel, I stamped the streamers from the Happy Dance stamp set in pastel rainbow colour randomly. Then stamped the sentiment on the bottom right of the panel using Versafine Onyx Black ink and MISI. The balloon cluster and the party hat are adhered using foam adhesives. This entire panel is adhered on the grey panel on the card front using foam adhesives. Finally added a few clear droplets for extra die mention. All the supplies used to make this card are listed below. Hope you are inspired by my card today. 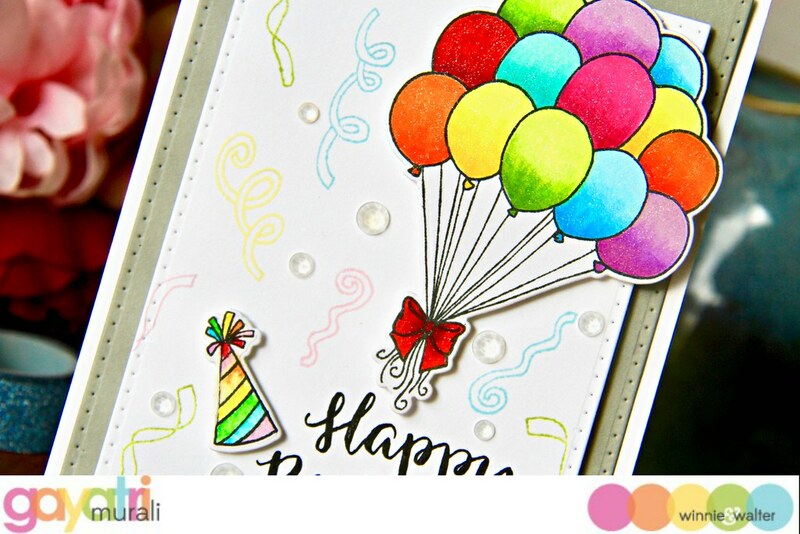 I think the rainbow balloon cluster and the party hat elements are the highlight of the otherwise simple card. Thank you so much for stopping by today. Have a wonderful week.